I have lately been asked and have noticed many mezuzos that are not affixed at their right place. The 1st picture is a double doorframe [very common], one where the door actualy closes, and an external frame. The correct place is shown here, the mezuza must be placed in the inner frame, that is correctly called "mezuzas ha'shaar" and the area within is "challal hapetach". In the 2nd picture - the mezuza is standing at the wrong place lechtchila. But bdieved or if impossible to affix at the inner doorframe, the second option is kosher if the mezuza is a tefach [8 cm] within the inner frame. Further away than a tefach is probably pasul. I think the same law applies to affixing the mezuza on the outer side of the outer doorframe, and even the wall next to the doorframe [pic. 3] - If the mezuza is within a tefach to its correct place [pic. 4] it is kosher, further than a tefach it is pasul [b'pashtus midoraysa]. The whole klaf of the mezuza must be totaly within this shiyur, any part protruding is not accepted, since it is not על מזוזות ביתך. It seems that lechatchila also the whole bais mezuza should be in the correct place, so as not to cause a misunderstanding for others - in regard to the correct hallacha of positioning the mezuza, and also because of Mar'is Ha'ayin. There are some further issues that are tzarich iyun on this subject, Bezras Hashem - next week. A. I am in doubt how do we calculate exactly the shiyur tefach, a straight arrow-line out in the air? or on the surface of the wall including the bends of the frames? In such a small shiyur = 8cm, this is significant! If all the people living in the building are jewish lichora this wall is called "shutafin" so he is placing a mezuza on the wall of shutafim to be poiter "beisecha" !? Tzarich Iyun if this is correct, at least lechatchila?? If the house has goyim living inside [other apartments] as well, lichora this wall of shutafin, can not be used to be poiter his house, since a goy is not mechuyav, and as understood from Rema YD 286:1 a house of shutafus yisroel v'nochri is patur. Most poskim I have discussed this with over the years interpret the chovas hador as follows: If the doorframe is made of two distinct materials and are essentially distinct - for example a broader doorframe made of brick and an inner of metal - you put it on the inner. However if the doorframe is essentially the same ie all of wood and stuck together and painted the same colour etc, as is common in most homes - although the part near the door known as the door stopper sticks out a little, it does not matter if you put it on the door stop or on the other part of the frame (ie pic 1 and 2 would be the same). However it is to be noted that if the doorframe is exceptianlly wide, you davka should NOT put it on the door stop (the part that protrudes) since it may not end up being in the outer tefach of the doorframe. 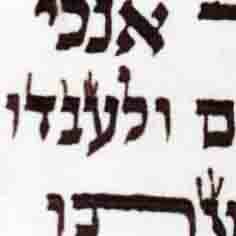 Although there is some sense to what you write in the name of the Rabbis, the pshat of the Chovas Hador does not spell this idea, but rather, that the part of the doorframe which is narrower is the challal hapetach. 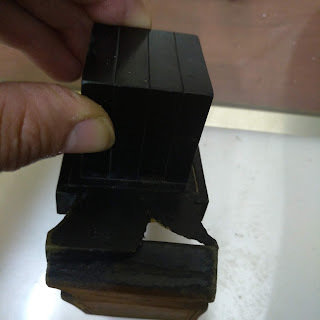 I have expressed a possible svara in one of my Hebrew blogs, that if it is obvious that the inner frame is tafel to the general frame [as you call it here - only a doorstopper] then it is tafel and the mezuza may/should be placed on the external frame. But one should be careful, because there might be no significant difference between the internal and external parts of the frame, so we can't say this is tafel. And according to Chovas Hador the narrower part is the challal hapetach. I would like to comment on the last statement of your comment "if the doorframe is exceptianlly wide, you davka should NOT put it on the door stop (the part that protrudes) since it may not end up being in the outer tefach of the doorframe." 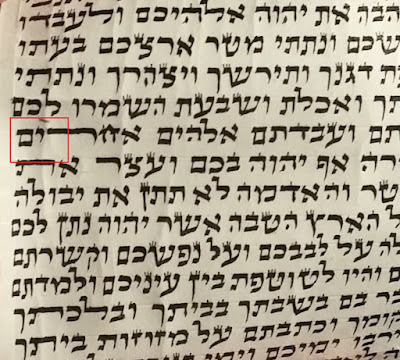 The law of tefach hachitzon is not meakev and is only lechatchila, but placing the mezuza not on the correct mezuzas hashaar is from the tora, and probably precedes the tefach hachitzon issue, and may [in some cases] even pasel as explained inside.